Don’t Freak Out… You are not alone! You are half way through grocery shopping and can tell that your Aspie is about to melt down. You know you should just 86 the whole thing, but you really need milk, bread and coffee. Eventually your child can’t stand it anymore and falls to the floor in anger. The outside world sees a screaming kid having a fit. You see the truth; your child has fallen off the wall and you need to help put this little Humpty Dumpty together again. Unlike the fairy tale, none of the Kings Horses and none of the Kings Men are coming to help. But you are not alone. We get it.And we will guide you to a calmer, happier place of acceptance and appreciation. • Break the cycle of worry, anger and guilt. • Show you a new way to view your child. • Help you to become a leader in your child’s life. • Offer you support, hope and even a few laughs along the way. 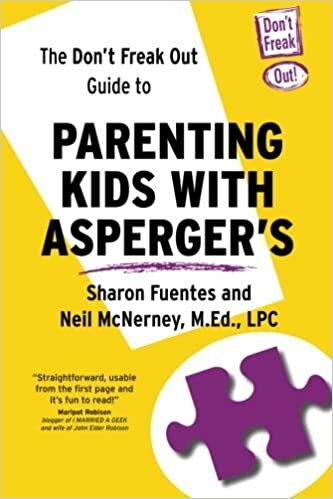 I loved this simple, straightforward guide to parenting kids with AS. The information, techniques and resources are easy to understand and usable from the very first page. What’s more, it’s fun to read. Thumbs up!